Look around your kitchen for food that might be good subject matter for your macro photography. My wife recently purchased a coffee maker that grinds the coffee fresh before it starts brewing, so we now have whole coffee beans in the kitchen. 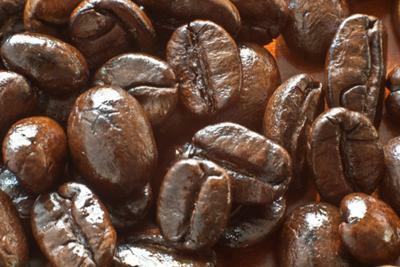 I used natural macro photography lighting by setting up my tripod and coffee beans close to a large double-hung window. No big story line behind this idea for a shot at this macro photo submission. There was half of a lime sitting on the cutting board, a leftover from a drink the night before. I cut a fresh slice, clipped a spring clothespin to the edge of the slice and then held that upright by clipping a utility clamp to the clothespin. I tried a few different clear and tinted CD cases behind the lime slice as backgrounds and liked the green background best. I had a small desk lamp aimed at the CD case to brighten it. I lit the subject with a small, portable 250w halogen, utility light from the left side and provided fill light by a small piece of white cardboard on the right. Not an exciting example of macro photography but I want to explore fresh ideas for some close-up photos. It is a good challenge to seek out mundane objects and create an image with visual impact. Not a great result but I do like the surface highlights and the spiral pattern of the lime. You can get ideas for macro subjects to photograph by looking around any room in your home. 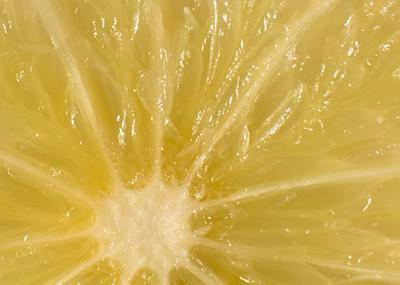 Some of them may mundane objects at first glance, but if you look closely you might find some interesting details, patterns, shapes to plan a macro photograph around. 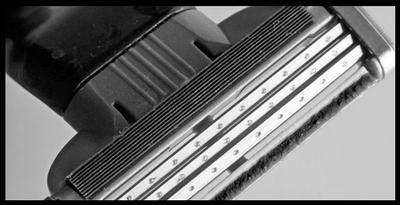 The simple act of shaving after my morning shower gave me the inspiration to shoot a close-up of a razor. 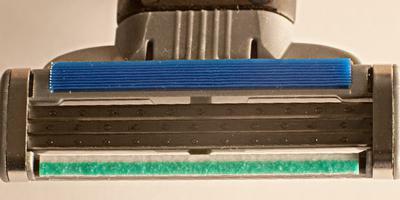 I photographed the Gillette Mach 3 handle and the triple blade cartridge. I shot the photo with a full-frame sensor DSLR, an 85mm lens and three extension rings attached together that added up to 65mm in combined length. With this combination I get about a 1:1 magnification. I converted the handle photo to black and white using an adjustment layer and liked it a lot better than the original color photo. That inspired me to do the same conversion to black and white with the razor blade and I liked that better than the color one too. I added the third macro photo to make a point about bad lighting and composition. No matter how good of a camera you buy or what accessories you use, good photography comes down to lighting and composition. The stainless steel blades are just like mirrors and photographing shiny metal objects is really photographing what they are reflecting. I had a utility light aimed at a big piece of white cardboard and rotated the razor blades to the right angle to get the reflection and then moved the camera into position. You can come up with an infinite number of macro photography ideas during your everyday daily activities with a little attention to it. The challenge is having the time set aside to practice your macro photography technique. Writing articles and making blog posts about photography forces me to keep at least some creative juices flowing. There is a lot more available in the kitchen for good close-ups. Have you thought of spaghetti, noddles, rice, or peanuts as a subject for macro photographs?